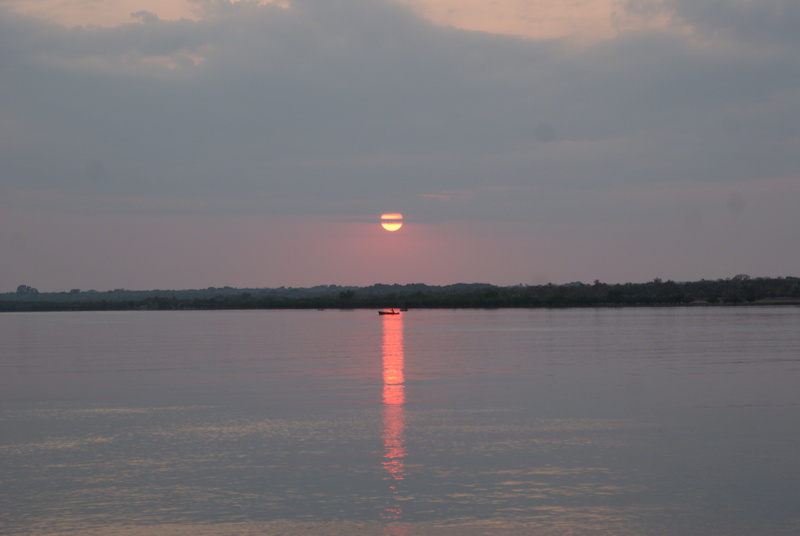 We have arrived in Richards Bay, South Africa, wahoo! Our 24 hours up to 10.00 today was 162 miles. The whole journey was 1188 miles in 8 days 13 hours or 205 hours giving an average speed of 5.8kts. Really pleased with that. Yesterday we sailed with 2 reefs in the main and the genny poled out to stop it slatting. We had F4 most of the day from the north east with the wind increasing during the evening to F5 but again from the north east so all good. 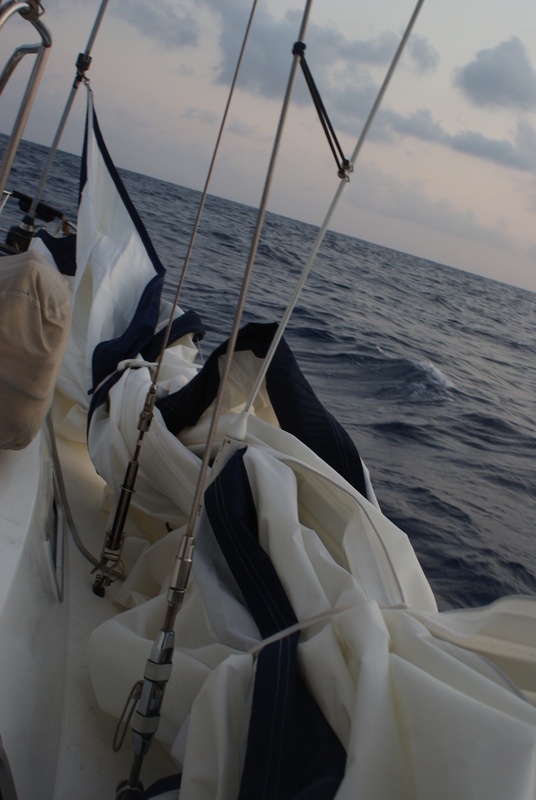 The current was giving us an extra knot or two and our boat speed was 7 – 9 kts most of the day. Last night was very dark and black without the moon and with the added worry of squall clouds. Bill took the early evening watch as the wind was forecast to increase and he experienced several 35kt gusts, although from the north east, with a bit of thunder and lightening in the distance but by 03.00 the wind died completely, as forecast, and the engine went on. It was very important we kept our speed up because the forecast showed a southerly creeping up the coast although it wasn’t due until after midnight but we wanted to arrive in daylight. While on the early watch this morning at 07.00 the wind generator suddenly sprang into life and the wind anemometer spun round to the south. Sam had told us of this yesterday so we were waiting for it. Fortunately it didn’t go higher than about 10 knots and only for about 3 or 4 hours but in that time the sea started to mount. I changed course slightly and all was ok but I wouldn’t have wanted the wind to go up to 20 or 30 kts. The engine stayed on all day even though the wind backed to the north east later. I went for a sleep mid morning and when I got up at midday the land was within sight. The smells that come off the land after you’ve been at sea for 8 days are interesting; here it was coal dust (big mining area). We spent the rest of the day motoring down the coast and arrived at the marina at 18.30 which was 17.30 south African time, after calling the harbour port control on vhf 12 to ask for permission to enter. The pontoons at Tuzigazi marina are in a bit of a state and I think we’ll just stay here long enough to check in and go round to the Zuluyacht club. The next couple of days will be taken up with checking in with immigration (passports stamped), customs and maybe the harbour master, (each country varies), sorting out sim cards for the phones, cleaning the boat inside and out, washing, and restocking our food cupboards and the fridge. Once we’ve got internet I’ll add some photos to the blogs. So we are in South Africa, WOW. Bring on Hluhluwe-iMfolozi wildlife park and game reserve, the hippos at iSimangaliso wetland park, Knysa harbour, Cape Town and maybe the Kruger national park with James and Hailey at Christmas to name but a few of the sites here. The main feature of our day yesterday was speed. As you can see our 24 hour run was good giving us an average speed of 7kts. This was achieved by the good winds and current we had yesterday. Although the winds weren’t strong, a nice F3 from the ESE giving us a beam reach, it was our second day with good current, that gave us the extra 1 1/2 knots. The Agulhas current has a fierce reputation in this area and around the Cape of Good Hope. Further north it doesn’t flow in the same direction all the time, as we discovered, but swirls around, hence the reason it was against us for 2 days. 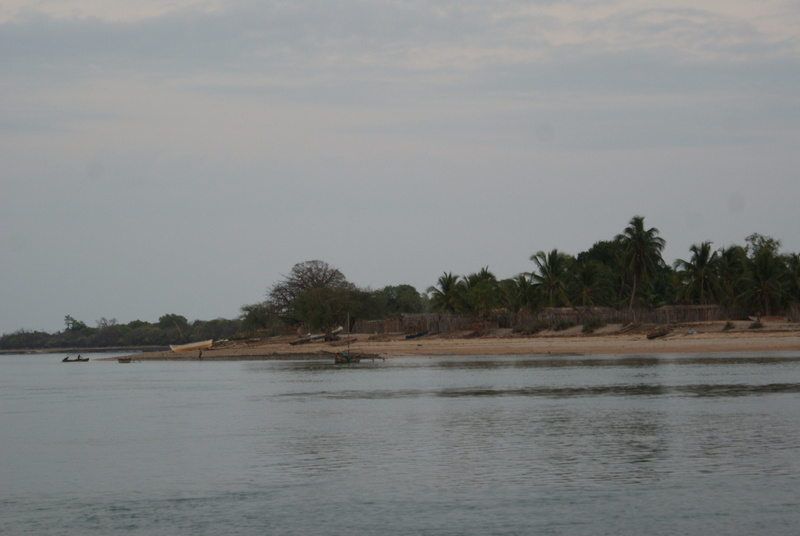 During the night we passed Ponta Zavora and now the current is more consistent and flowing north to south. That’s ok as long as you don’t get a southerly buster coming up against the current, which is what causing the big seas. We are in daily contact with Sam on SAMM (south African maritime mobile)net and his forecasts have been very accurate. We are now on the rhumb line to Richards bay and it’s looking good for our entry tomorrow. I spent 15 minutes on the radio with him this morning taking down 6 hourly forecasts for the next 48 hours. The main feature later today is NE 25 – 30 kts which is high but will be behind us so hopefully will give us a final push. One more day of prayers and fingers crossed. Our 24 hour run to 10.00 this morning was 120 miles which is down again because we had about a knot and a half of adverse current against us. It’s been quite a difficult 24 hours. We had a good morning sailing albeit a frustrating one because our boat speed was between 4 1/2 to 5 1/2kts but it felt like we were traveling more like 6 or 7kts. It was a trade off because we had to head south before the south easterlies strengthened in the evening when we could bear away but that had taken us into the area 20S 40E which, according to the OSCAR files, is right in the middle of the adverse current area. We could see where the good current was to the west of us but if we had headed west at that stage we would have been headed when we came round the coast into the south easterlies. It’s better to have the wind in the right direction and if you are lucky enough to get current too then great. After my sleep in the afternoon I had a shower. Then Bill decided to have one too. I was sitting working at the chart table at 5.45 when I heard a light thump up above me. I had just decided to go and see what it was when I looked out of the starboard window to see the genoa coming down into the sea. I called for Bill to come quick and he came running out of the shower all covered in soap bubbles! The genoa halyard (rope that holds it up ) had broken at the top of the mast and was laying on the deck (The thump) and the genoa was in the water. Bill and I struggled for about 10 minutes and managed to get our new 130% thick genoa out of the water and laying on the side deck, we weren’t going to lose it. Fortunately it was still attached to the foil swivel at the bottom of the fore-stay so hadn’t come off completely but the foil swivel should be at the top of the mast. A quick look at the end of the halyard and we could see that the splice had disintegrated, probably from sitting out in the sun all the time. This left us with a problem – Bill had to go up the mast to get a line down inside the mast so we could re-thread the halyard. It was getting dark and we had a forecast of 20kts for later so it had to be done quickly. I was due to talk to Tintin at 18.00 so I quickly called them and gave them our position so they were aware of the situation, they were 28 miles away but heading in our direction. The main was still up and was left up to stabilise the boat. We thought about hoveing too but Bill thought that would make it too rolly in the seas we had. We both moved quickly and within 10 minutes Bill was climbing the mast steps with the spinnaker halyard attached to him as a safety line which I was in charge of. The mast was like an upside down pendulum, although it didn’t swing around too far but Bill struggled to get to the top of our 60ft mast which was damp and slippery from sea spray. 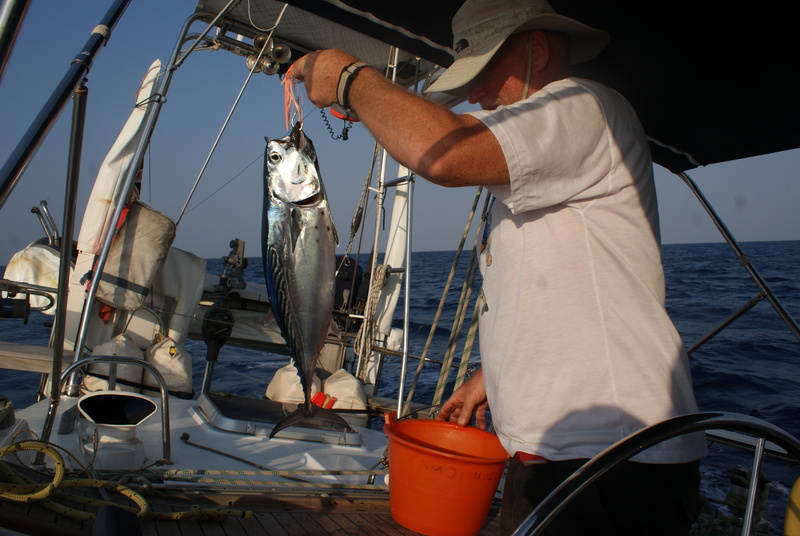 Bill had taken a thin line with a fishing weight attached to it up with him which he intended to drop down inside the mast, I pull it through and we could use that tied to the halyard to take it back up – the line got stuck and Bill couldn’t get it in or out; frustrating. I sent up a knife to him on another line but that got tangled to, we were both aware the sun had already gone down and the wind was already starting to build. Eventually (with a lot of swearing) he got things untangled and cut the line but he’ll have to go back up the mast when we get to Richards bay and sort it out. 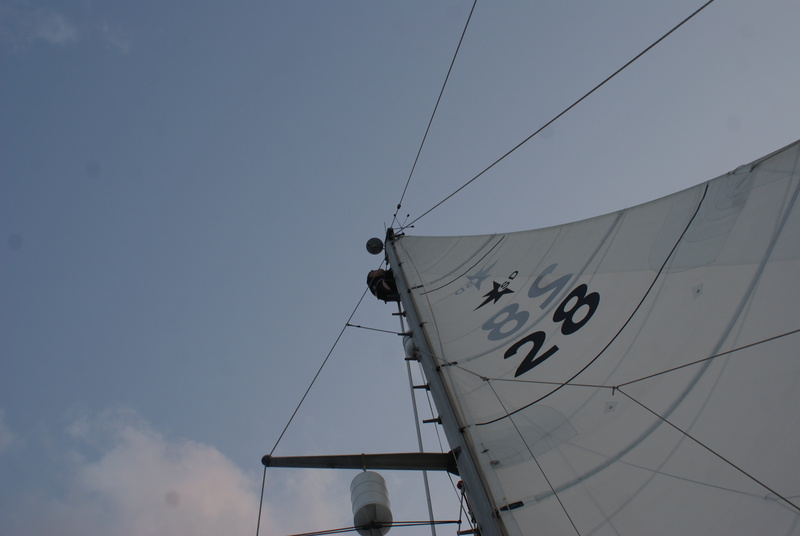 While up the mast Bill checked the alignment of the spinnaker halyard to see if it would do the job of the broken one. Fortunately it looked like it would so that was plan B. It took Bill about 20 minutes to get back down. I lowered him down slowly while he held on to the shrouds and tried to stop himself banging into any thing and injuring himself. A few muscles were pulled. Thankfully he got down safely but we still hadn’t got the sail back up. Bill returned to the fore-stay to attach the spinnaker halyard. With the force of the sail pulling on the swivel while it was in the water the swivel was jammed. Bill had to give it several big thumps to free it. Then it was my turn to be brave. To get the sail back up the foil someone had to be on the fore-deck feeding it into the foil while Bill winched the sail up from the cockpit. 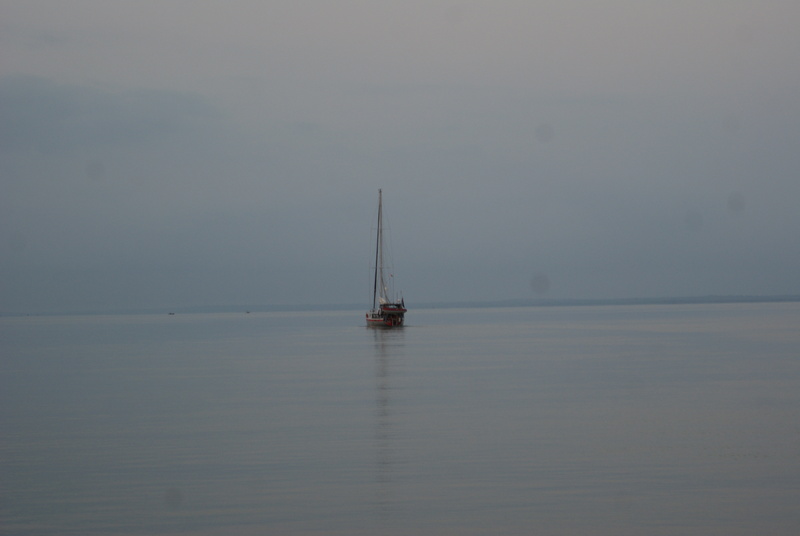 By now the wind had risen to about 15kts and it was almost dark. I put my life jacket and harness on and made my way to the fore-deck bearing in mind I had had a shower that afternoon with clean clothes on! I sat on the bow seat with the sea spraying up my back as Bill winched the sail up with his already aching arms while I threaded it into the foil with one hand and trying to hold on to the sail with the other hand. It was too strong for me and I couldn’t hold it. Bill shouted to just let it go and feed the sail so I did. It gradually lifted and the sail was flogging quite badly but another 5 minutes and it was up. Bill then winched in the reefing line to put the sail away while I cowered to stop from getting whipped by the sheets (ropes attached to the sail to pull it in and out). We had done it. The sail appeared to be working ok and once I was back in the cockpit we pulled it out and continued on our way. Later I asked Bill if he was scared and he said he was a bit worried. Our sons know what that means. 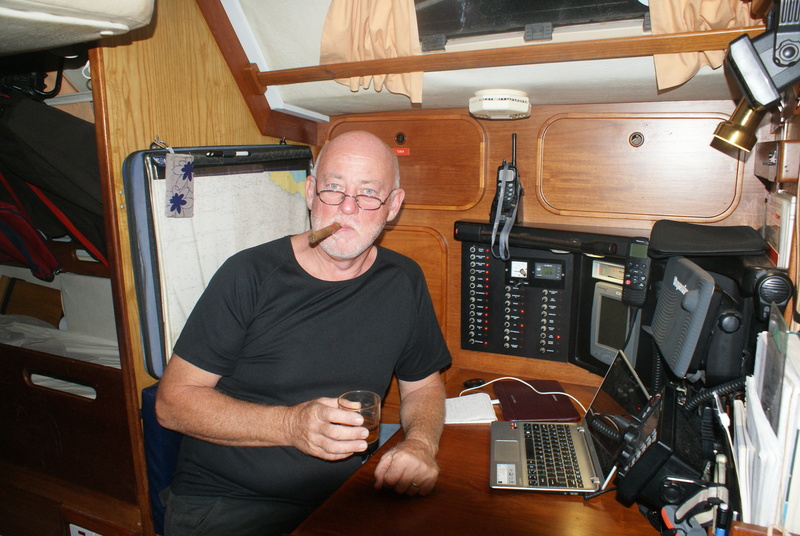 At 21.30 we reached our southerly waypoint and were able to bear away for a more comfortable ride. Bill set the boat on course then went below for a well deserved rest while I watched the most amazing moon rise. I was very jumpy on my watch. Every time the boat creaked or there was an odd thump, on would go the torch to see what I could see. Just after my 22.00 log reading I worked out we had just gone passed the half way point. We’ve completed 589 miles and we’ve got 585 to go. I celebrated with a piece of banana bread with treacle. All is now well on board. 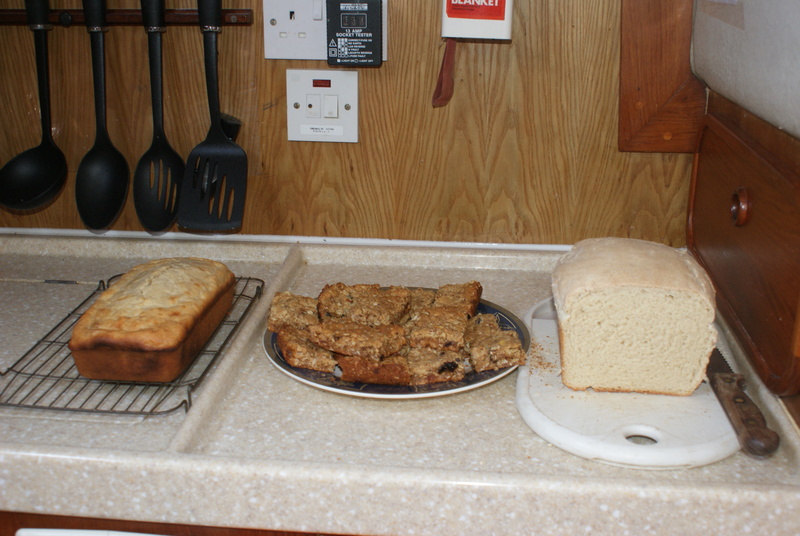 We motored all day yesterday, it was boring but I had a busy baking day and made bread, a banana loaf and some muesli cookies. The good news was we seemed to pick up about a knot of fair current so that helped us on our way. Our boat speed was about 6kts with only 1800 revs. Our course was around 230 degrees and Bill’s strategy was to do a 24 hour “burn” to place us squarely in the forecast NE airflow off to our west. The wind started to build during the evening and the engine was finally turned off at midnight exactly 24 hours from it being turned on the night before. Bill sailed Camomile through the rest of the night while I tried to get some sleep before we swopped over at 05.30, it’s starting to get a bit chilly at night as we head south. On the net this morning I took all the positions of the other boats with us. Tintin were about 40 miles behind us sailing nicely too. Fruit de Mer were sailing with light winds but Norsa and Solstice are waiting for the wind to fill in. They left after us and are 2 days behind us. The net was on 8110mHz this morning and will continue on that. Afterwards I managed to listen to SAM net on 14316mHz and he was able to give me a forecast for the next couple of days which were looking good. So at 10.00 this morning we had 15 kts of northerly wind and sailing goose winged on a course of 185 degrees at a speed of 7 – 8kts. You can see from our 24 hour mileage runs that things have improved. Camomile and Tintin left Baly bay yesterday at 05.30 with a beautiful sunrise in our wake. We followed Tintin out of the calm lagoon. The plan was to head north to get off the shallows and avoid the fishing boats overnight – the wind had other ideas. The sails were hoisted as soon as we got clear of the bay and motor sailed until about 16.00 when the wind strengthened and we were able to turn the engine off. Unfortunately when we turned to the west the wind was right on the nose – why does it always do that??? We had traveled only 110 miles in 24 hours but only 85 miles towards the waypoint – frustrating. The good news, WE CAUGHT A FISH. In fact we caught 2 as we had 2 lines out. One got away along with one of Bill’s best lures but we landed the other one. The first fish we’ve caught this side of Australia so that’s over 3 years. It was a blue fin tuna and I managed to cut 4 nice fillets off of it. They turned out quite expensive though because as Bill was reeling in the trolling line the plastic handle, which has sat out in the sun for the last seven years, broke. I handed him the gaff which had been stored under the solar panel but had obviously rotted and broke and fell in the water when he tried to lift the fish with it. It was gutted using my scissors but they were accidentally thrown over the side with the contents of the bucket full of guts. Not sure if we are going to bother again!